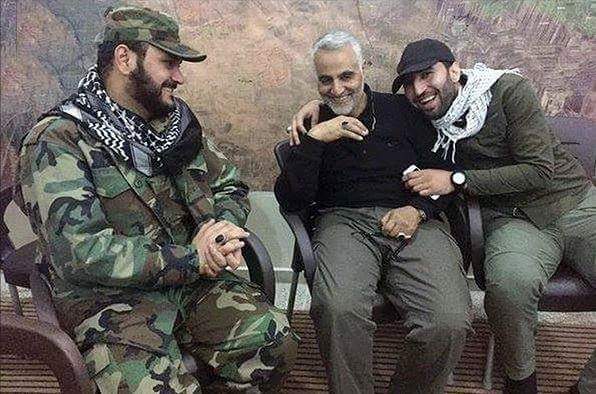 Qassem Soleimani, the commander Iran’s Qods Force, the external operations wing of the Revolutionary Guards Corps, has been photographed with Harakat al Nujaba leader Akram al Kaabi, a US-designated terrorist who fought against US troops in Iraq. 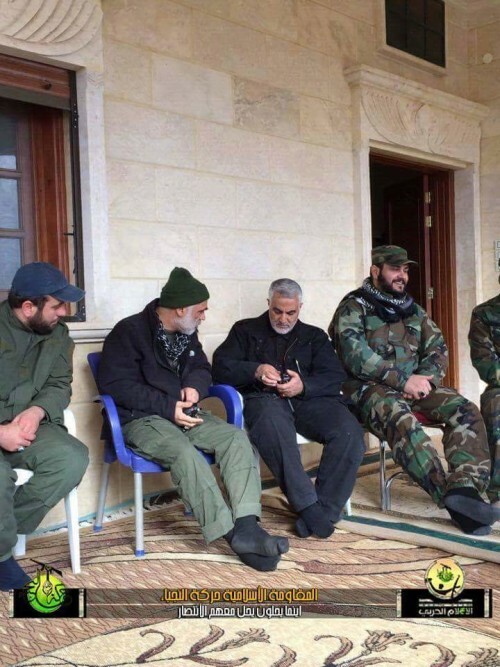 Two photographs, posted on Harakat al Nujaba’s official Facebook page, show Kaabi and Soleimani sitting together in the northern Syrian province of Aleppo. Kaabi was dispatched to Syria earlier this month to help President Bashar al Assad’s forces break the Islamic State’s siege of the Kweiris air base in Aleppo province. On its website, Harakat al Nujaba said that “Sheikh Akram al Kaabi entered Aleppo to head a massive force of large reinforcements to lift the siege of Kafraya and al Fua.” The two towns are the regime’s last enclaves in Idlib province and have been under siege by rebels and jihadists, as the latter groups try to consolidate their control over the northwestern province. Harakat al Nujaba has been deployed in Aleppo for some time. Kaabi’s hatred towards the US goes back at least a decade, when he was a commander in Muqtada al Sadr’s Mahdi Army. In 2008, the US government listed Kaabi as an individual who threatens the security of Iraq under Executive Order 13438. Also listed along with Kaabi was Abdul Reza Shahlai, a Qods Froce commander. Debka had a story from the Syrian rebels that they ambushed a convoy with Soleimani in it and he was killed along with some other leadership in N Allepo. Thought it nothing (debka is salt until another source confirms) but the fact that Soleimani is admitted in the area described it give a little more possibility for consideration. Would be one hell of a blow if true. Still questionable but we will have to see, even if true it will take months or longer before Iran admits to it. Is it just me, or is there anything to the fact that all three seem to be wearing a gold/onyx type ring on their right hands? Political/cultural/military affiliated? In Islam Gold Ring is forbidden for Men. hmmmm. So, are the rings not then gold ones; or are you asserting that these gentlemen are not following islam, or what, Sir? re: gold w/onyx rings … maybe the old plastic key to heaven just doesn’t attract youngsters to the revolutionary guard orgs like in the war w/ Saddaam days? So he’s a terrorist because he opposed the US occupation of Iraq and attacked the occupying army? This kind of crap is the reason people like me basically consider the official terrorist designation meaningless. These guys, along with Hezbollah (also so-called ‘terrorists’) did great infantry work over the past couple of weeks in lifting the three year siege of the Kuweiris airbase and pushing back ISIS (an actual terrorist outfit) far enough where the Syrian airforce will be able to safely fly planes out of it to do close air support for further attacks against real terrorists. Referring to Nujaba and Hezbollah as terorrists is just meaningless drivel, and basically is just done to please the Saudi Arabians who have sown more terror and murder than everyone else put together. A historian you are not, Hezbollah has been around a long time. They have shown up in places as an invading force and helped destroy a once peaceful and beautiful Lebanon. They have committed many acts that killed innocent people. They are just more organized than AQ or ISIS. They answer to their Iranian masters.